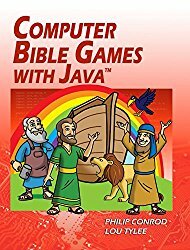 COMPUTER BIBLE GAMES WITH JAVA teaches Java Swing GUI (Graphic User Interface) programming concepts while providing detailed step-by-step instructions for building many fun games. The tutorial is appropriate for teens and adults. The games built are non-violent and teach logical thinking skills. To grasp the concepts presented in COMPUTER BIBLE GAMES WITH JAVA, you should have experience with building Java projects and be acquainted with using the Java Swing control library. Our tutorial LEARN JAVA GUI APPLICATIONS tutorial will help you gain this needed exposure.COMPUTER BIBLE GAMES WITH JAVA explains (in simple, easy-to-follow terms) how to build a Java game project. Students learn about project design, the Java Swing controls, many elements of the Java language, and how to distribute finished projects. Game skills learned include handling multiple players, scoring, graphics, animation, and sounds. The game projects built include, in increasing complexity:Noah’s Ark – Race the turtle to Noah’s Ark before the Great Flood startsElijah and the Ravens – Move Elijah to catch the falling bread as he is fed by the RavenDaniel and the Lions – Shoot Prayers at the Lions to protect Daniel in the Lion’s DenThis course requires either Windows 7+, MAC OS X 10.8.3+, or Linux. To complete this Java tutorial you need to have a copy of the Java Development Kit (JDK) Standard Edition (SE) installed on your computer. The Java Development Kit SE is a free product that can be downloaded from the Oracle website. Oracle's website also contains the complete downloading and installation instructions for the latest version of Java. Our Java tutorials use the free NetBeans 8 IDE (Integrated Development Environment) for building and testing Java applications.The Java source code and all needed multimedia files are available for download from the publisher's website (BibleByteBooks.com) after book registration.